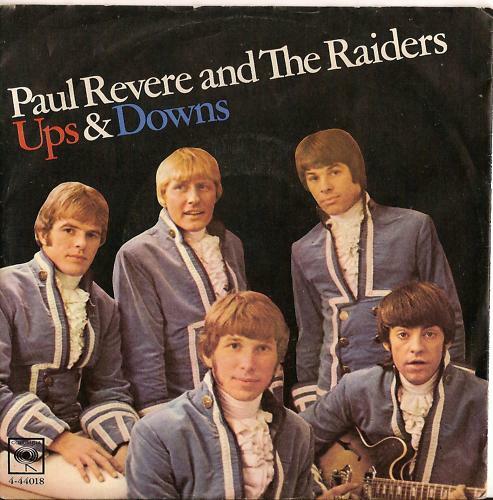 Desert Island Singles: “Ups And Downs” by Paul Revere and The Raiders (1967) | Name-Brand Ketchup. By 1967, the hit making machine known as Paul Revere and The Raiders had followed the lead of The Beach Boys and morphed into two separate entities: the live performing band, ably led by Revere himself, and the studio band, comprised of lead singer Mark Lindsay, studio whiz Terry Melcher (son of Doris Day, which may explain how he had carte blanche at Columbia Records), and countless session musicians. The live band still appeared each weekday on “Where The Action Is,” but merely to lip-sync to the tracks Lindsay and Melcher created. “Ups And Downs” was the last single that ostensibly included the classic “Where The Action Is” lineup. It was written and produced by Lindsay and Melcher. Reviewer Philip A. Cohen believes that the studio lineup may have included some combination of Lindsay, Melcher, and Levin plus stalwarts Ry Cooder, Van Dyke Parks, Hal Blaine, Jim Gordon, and Jerry Kole. From this point on Lindsay would make the records with whomever he wished: session men and/or some Raiders, but not Revere himself. As an 11-year-old kid, though, I didn’t know any of this and probably would not have cared. I bought the myth. To me The Raiders were Paul, Mark, Fang, Smitty, and Harpo, just like on the cover of the 45. And this was one of my favorite songs of theirs. A great lead guitar hook at the beginning, probably played by Levin. A very cool McCartney-esque bass line. A keyboard riff that sounded almost like barrel-house piano. Great horn fills. All in all, an awesome single worthy to be issued under the name of Paul Revere and The Raiders. The YouTube clip is from their “live” performance on “The Smothers Brothers Comedy Hour.” They’re obviously performing to the studio track, but they make a change in the phrasing of the chorus that’s about a hundred times better than the official release. Dig the footwork by Fang and Harpo. I’ve been up, down, all around now, baby….